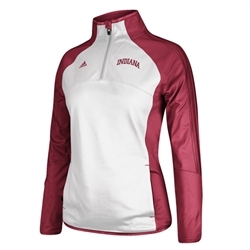 This great looking Ladies' 1/4 Zip Training Jacket from ADIDAS is made of 100% polyester with Climalite technology. Crimson jacket with full front white panel is embroidered with INDIANA over left chest and screen printed Adidas logo on the right. Styling includes tonal dazzle crimson stripes down sleeve, thumb holes and front pockets. This jacket is a 'relaxed fit' so the sizing is true. This would make a great addition to any Hoosier fan's wardrobe!